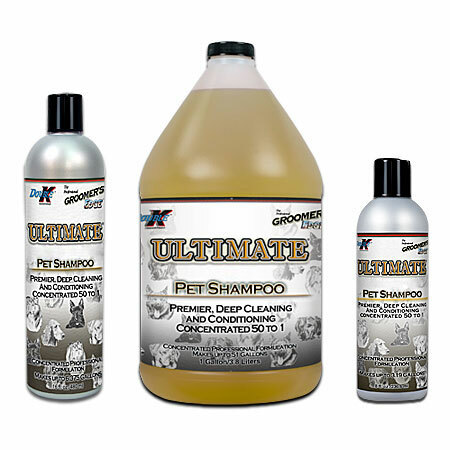 ULTIMATE® is the perfect shampoo for the widest range of coat types. ULTIMATE® achieves “best in show” results on the finest animals with excellent luminizing and volumizing effects. This exceptional shampoo also deeply cleans very dirty and smelly animals and removes stains with gentle thoroughness. The emollient and humectant rich formula is great for everyday use. Conditions coat, softens skin and leaves coat luminous and manageable. Great for dogs, cats, puppies, kittens, horses, cattle and other companion animals. Extreme concentration of 50 to 1 creates ULTIMATE® value.